A number of connectors are available out-of-the-box with the Coveo Platform (see Coveo Platform Connectors). 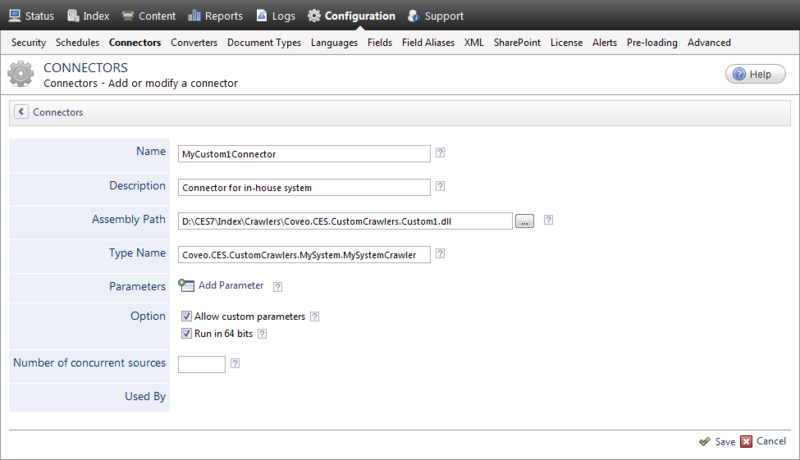 You can also add other custom or prototype connectors to your CES configuration to be able to index other repositories and systems. Example: Your in-house programmers, Coveo Professional Services, or a third party, developed a connector for your custom CMS system so that you can bring its content into your Coveo unified index. Note: You can also contact the Coveo Professional Services to get assistance to develop your own connectors for example for in-house custom repositories/systems using the Open Connector API (see Connector API Home). Get the connector files, ensuring that they are compiled for your version and release of CES. Ask for the name of the class implementing the connector. For a documented prototype connector, contact Coveo Support. For a custom connector, contact whoever developed the connector (Coveo Professional Services, in-house, or third-party developer). Copy the connector files to the [CES_Path]\Bin folder. Example: On a 64-bit server, copy 64-bit versions of the connector files to the C:\Program Files\Coveo Enterprise Search 7\Bin folder. If you have a 32-bit version of the connector files, copy them to the C:\Program Files\Coveo Enterprise Search 7\Bin\Win32 folder. In the Connectors page, the currently available connectors are listed. Click Add. In the navigation panel on the left, click Additional Connector. In the Additional Connectors page, click Add. A name of your choice to identify the additional connector. A description of the type of repository indexed by the connector. The full path of the additional connector assembly file. Note: If the path is incomplete, CES searches for the assembly file in its [CES_Path]\bin directory (by default, C:\Program Files\Coveo Enterprise Search 7\Bin). The name of the class implementing the connector. Note: The parameter is optional when only one class is inheriting from the CustomCrawlers class. When this is the case, you can leave the box empty. Allows you to define explicit parameters. Click Add Parameter to display the Modify the parameters of the additional connector page (see Adding an Explicit Connector Parameter). You must add the following parameters to get the Security section in the Add Source page for sources of this type and allow you to specify the security provider and user identity that the source will use. For 64-bit servers, select the Run in 64 bits check box to instantiate the connector in a 64-bit process. Specify the maximum number of sources using this connector that can operate concurrently.